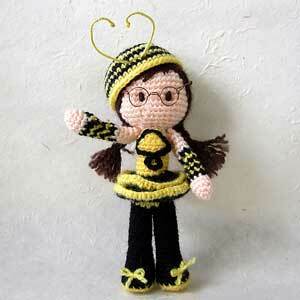 It's the Bee's Knees: The Buzz on 10 Free Bee Crochet Patterns! 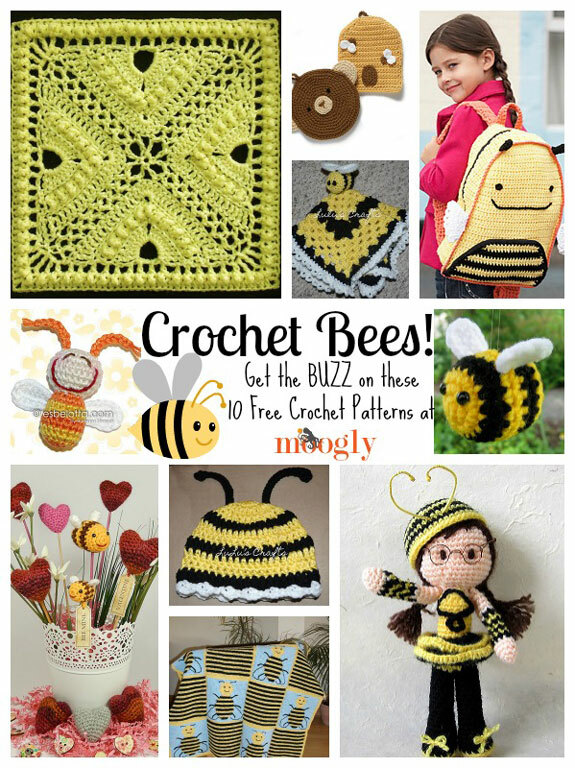 It’s the Bee’s Knees: The Buzz on 10 Free Bee Crochet Patterns! Spring has sprung, and soon the green leaves, colorful flowers, and warm breezes will return. And with them, all things that buzz and whizz! 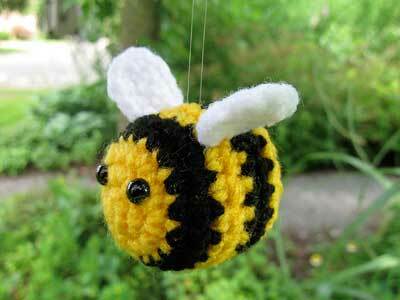 Bees are so important for life here on this green planet, and they’ve inspired numerous crochet patterns. 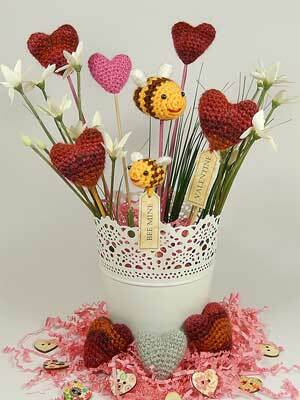 So here are 10 beautiful honey and bee crochet patterns to get your hook buzzing! Click on the name of the patterns you like to go to the page for that pattern! 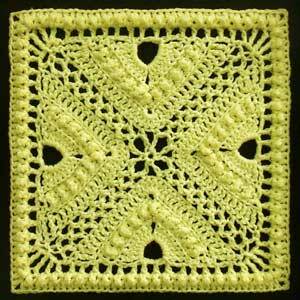 Bee Hives and Clover Afghan Block by Joyce Lewis, on Ravelry: NO LONGER FREE – This unusual block is based on an antique lace pattern – but it looks modern and new! Love the single color version the designer made, as well as the multicolored ones made by other crocheters! Hearts and Bees by Moji-Moji Design: So super cute – and they come with a bunch of ideas for how to use them! Bumble the Bee by Emi Carmichael, on Crochet Me: Adorable!! This one was made by Amy Thornton – check out her patterns HERE! 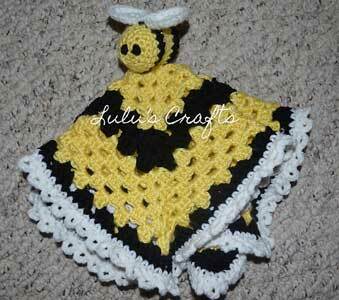 Bumble Bee Lovey by Kelsey Bieker, on LuLu’s Crafts (link to Ravelry PDF): Cozy bee blankey for the littles! 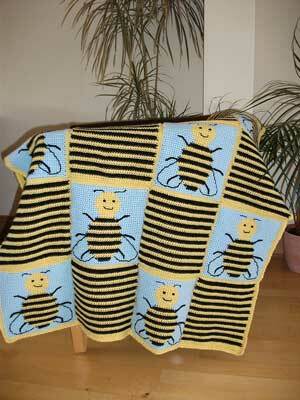 es-BEE-lotta by Barbara Strasser, on Ravelry: Such an irresistible smile! Love it! Note that this is in UK terms. 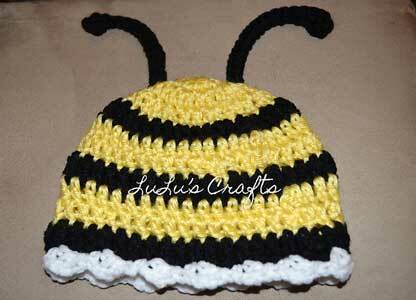 Bumble Bee Hat by Kelsey Bieker, on LuLu’s Crafts: From the same designer as the lovey above – they make a great gift set! 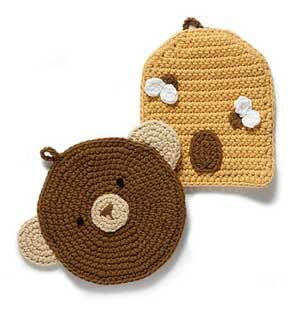 Beehive Potholder by Lion Brand Yarn: This super cute and practical potholder comes with a bear pattern too – a perfect pairing! 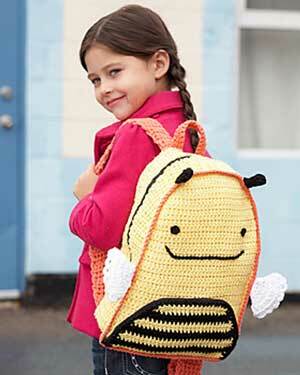 Busy Bee Backpack by Lily / Sugar’n Cream, on Yarnspirations: Don’t need another Easter basket? What about making one of these and filling it with candy! Much more practical (and cute as can bee)! Bee Squares Blanket by Meike Beumers, on Ravelry: This one is also in UK terms – but it’s sweet little bees are worth translating! Bee Girl Amigurumi by Serah Basnet, on Tales of Twisted Fibers: The bee girl is a classic icon for my generation – and this amigurumi is just too much for words! Love love love! 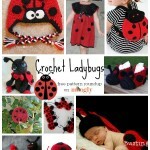 I hope you enjoyed this free bee crochet patterns roundup! 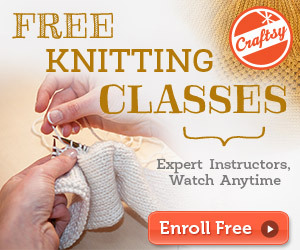 Have they given you the buzz to crochet? Do you have a roundup request? Let me know in the comments! Thanks for reading! Get Moogly on your favorite social media sites: Facebook, Twitter, G+, Pinterest and Tumblr, and sign up for the Newsletter so you don’t miss a thing! 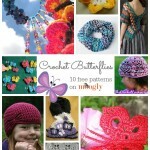 Beautiful Butterflies: 10 Free Butterfly Crochet Patterns! 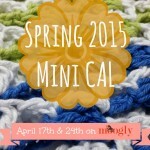 Announcing the 2015 Mini Crochet-Along #2: Rainbow Runner! 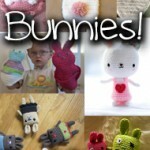 Hop into Spring with Crochet Bunny Patterns! I am looking for a crochet bee slipper pattern for toddlers – adult? Hi Nancy! I’m afraid I haven’t seen anything quite like that. But you could certainly take a plain slipper pattern and work the rows in black and yellow stripes! 😀 Thanks so much Carrie! It was such a fun roundup to put together. I would’ve loved to add that block to the CAL too – so pretty! Están preciosos los trabajos quisiera poder realizar los pensamientos. Como puedo obtener los diagramas para realizarlos gracias bendiciones. Entiendo! La mejor recomendación que puedo hacer es ponerse en contacto con el diseñador – ella podría ser capaz de armar algo para usted! Is there anyway to get the antennas to stand up ??? Thank you. I took a “G” crpchet hook and shortened my chain to 15 and followed the pattern and that worked well also !!! Thank you. I took a “G” crochet hook and shortened my chain to 15 and followed the pattern and that worked well also !!! 🙂 You’re very welcome Rosalie! When I went to the afghan square it was not free. What happened? Looks like the designer changed it to paid, sorry about that! Ah, she must have changed it, thanks Andria! I’m not long at crocheting. I started it so that I could make my new granddaughter something different. I’m getting on fairly well but I have just been asked to make a Bumble Bee for a friend. The patterns here are great but I was just worried on one pointed. In all the tutorials I’ve looked at, they have said to stay away from black wool as it’s almost impossible to find the links (loops). Before I buy some black, is it so difficult? I found dark navy daunting. Thank you for your swift reply, I think I’ll give it a go. Oh how strange! Do you need a conversion table?